karakter op veel lagere hoogte, soms zelfs op zeeniveau. • In de tekening is het upland alles boven de Fell wall. Het is dus de open fell. .. grofweg alles hoger dan 1,000 feet ( = geel en bruin) in deze kaart. .. een upland. karakter heeft, soms zelfs tot op zeeniveau. 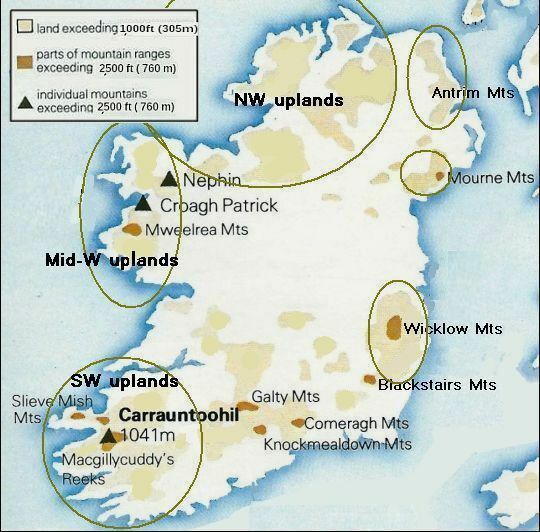 tree-planting and deposits of atmospheric pollution. typically shallow ( a few metres). high levels of acid leaching occur. It is characteristically underlain by an expansive ‘blanket’ layer of peat. gradually accumulates into a layer of peat. (Examples of species are Sphagnum mosses and cotton grasses). of the last glaciation, 10,000 years ago. Initially peat formation was confined to shallow lakes and wet hollows. occurred to form the blanket bog habitat we find today. when the climate became wetter. 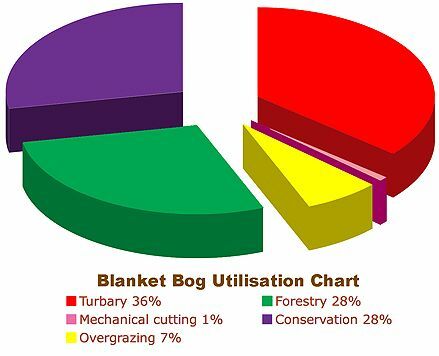 number of reasons for conserving blanket bogs. important country in Europe for this type of habitat. and cattle, grouse shooting, deer stalking and fishing. 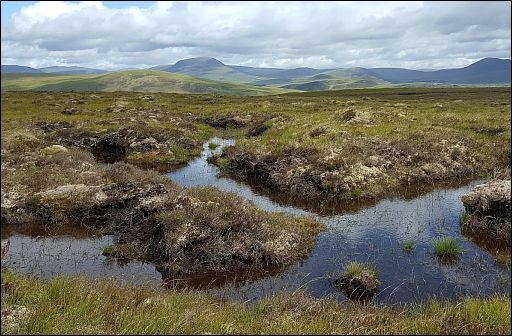 have seriously depleted the area of blanket bog suitable for conservation. 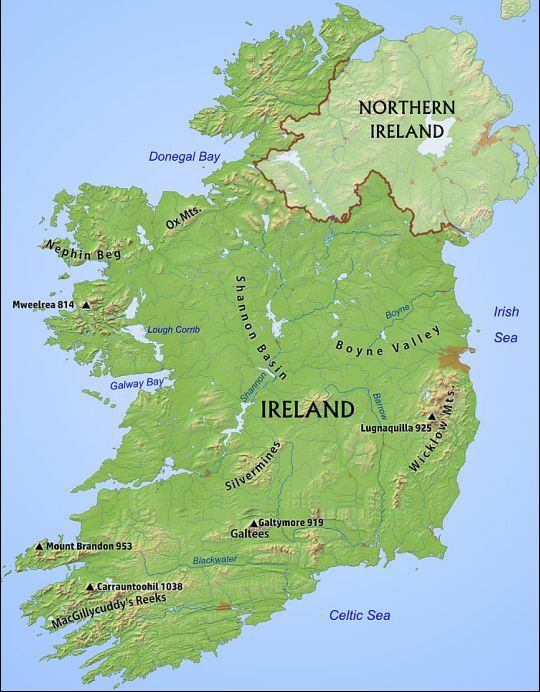 Only 28% of the blanket peatland resource remains in a relatively intact condition in the Republic of Ireland. process. Peat is still being cut privately. and in 2000 a further 7% was deemed threatened by this activity. degrade the integrity of mountain blanket bogs. .Upland heath occurs on steeper slopes than blanket bog. by a cover of dwarf shrubs of at least 25%. Western gorse (Ulex gallii) occurs in the south and west. f mosses including Sphagnum species. 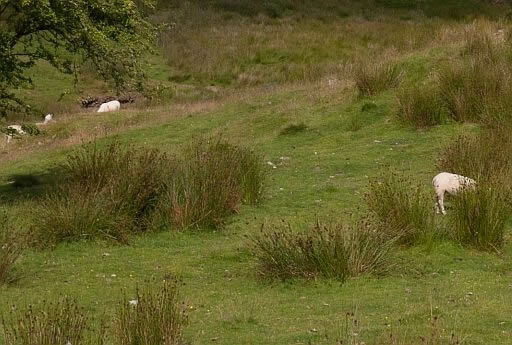 • Upland acid grassland and rush pasture. Upland grasslands are the result of human intervention through livestock grazing. fescues, mat-grass and wavy-hair grass. More nutritious grasslands occur on areas of fertile or lime-rich soils. In Groot-Brittannië zijn ze echter niet bebost (denk aan de kale Pennines).